**Fisherman's Wharf** BAY VIEWS, INCLUDES PARKING, UPSCALE - NO STAIRS. Dog ok.
BAY VIEW: Upscale San Francisco at Fisherman's Wharf - Modern. Upscale, Bay View vacation home. No stairs. Parking. Modern and Clean. Fully-equipped with Full Kitchen, Washer/Dryer, Parking. Telegraph Hill Neighborhood: Near Coit Tower & Fisherman's Wharf, Pier 33 Alcatraz Cruises, Exploratorium, Telegraph Hill Pioneer Park, Bay Club San Francisco, Levis Plaza, Fog City, Hillstone, Pacific Fertility Center. PLEASE NOTE: DOG MAY BE PERMITTED BY PRIOR AGREEMENT ONLY. WiFi, Imported tile, granite, quality contemporary furnishings, full kitchen, washer/dryer in the unit, luxury linens, and cable internet. 30 day minimum stays with preference for extended stays of 3-6 months or longer. Available by advanced request only, must be in writing at lease 7 days prior to scheduled arrival, as installation is required. Prime space (designated) in secure underground garage. Space is close to elevator. Exceptionally convenient. Spices, oil/vinegar, and limited pantry items. Building is accessible. Unit has significant limitations. Call for detailed info. Full Gym, Professionally maintained Hot Tub / Jacuzzi & Sauna, Fitness Area, elevators, modern building, doorman, electronic keys, secure PARKING with designated space near elevator, WiFi, washer and dryer in unit, full kitchen, BAY VIEWS! Great location, with every amenity, great views and clean as a whistle. I stayed at this condo for 1 week and had a wonderful time. We were within walking distance of Fisherman's Wharf and the Ferry Building and delicious restaurants, we enjoyed great bay views, and paid 1/2 the cost of financial district hotels. I had 3 days of meetings in the financial district and never waited more than 5 minutes for Uber to arrive for the 10 minute trip. Having a place to park our rental car was great--the hotels charge at least $25/day for parking. 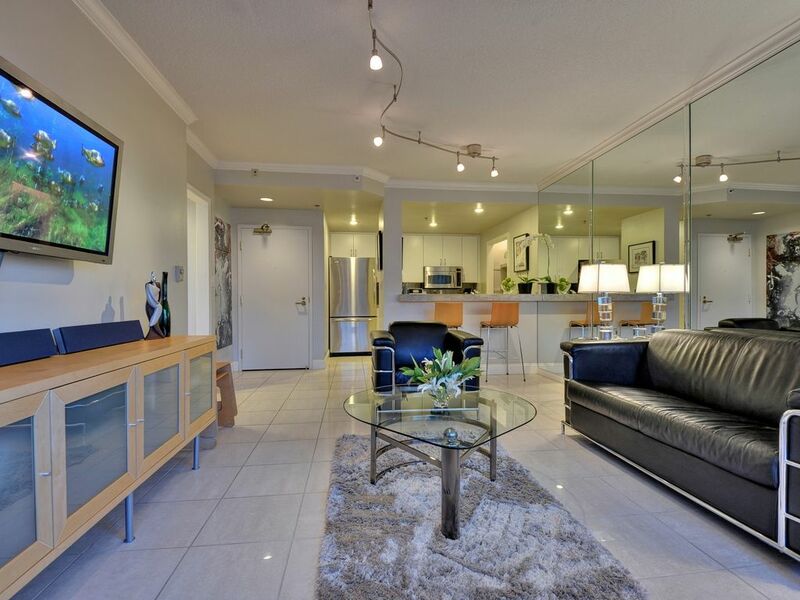 The condo is perfect for 2 people and we wouldn't hesitate to stay again. Just as described - and probably better! Outstanding bay views and super access to fisherman's wharf, great restaurants, shopping, and includes optimal parking space and secure garage underneath building. Elevators, gym, very private and secure. Professionally managed and exceptionally well appointed. Apartment is in great location, and much nicer than most vacation rentals we've ever stayed in! We really enjoyed our week in the apt. It is so nicely furnished, clean, and well equipped we felt right at home. The owners do everything to make certain renters have all info necessary. Location can't be better.....short walk to fishermen's wharf, Ferry Bldg., and only a block from the historic streetcar line that runs across town ( even gets you to AT & T park for ball games). Lots of restaurants, etc. in the neighborhood, plus ferry boats to Sausalito, Alcatraz, Angel Island, Oakland. There's no need to have a car with this location. We were sad to leave, but look forward to a return visit! We enjoyed a nice long stay at this incredible location. It’s the first San Francisco place I’ve loved enough to review. The building is super modern, clean, exceptionally quiet, great views from the unit, well located to Fisherman’s Wharf, Ghiradelli Square, North Beach, Coit Tower, and still close to Moscone, Union Square, China Town, etc. You can literally walk everywhere from this outstanding location. Excellent public transportation, and great parking spot if you bring a car. We enjoyed walking the neighborhood, along the bay front, and using the gym. Inside the condo feels very spacious, clean, and the views are even better than those shown in pictures online. There is a clean smell, and a steady flow of cool air that blows in off the bay into the living and bedroom areas. No dust or dead bugs, and super clean and trust me, I went through all the cupboards and drawers!. Supplies were abundant and available. The kitchen was beautifully done and well stocked with cookware, utensils, and pantry items. Although we hadn’t planned to, we ended up eating in for much of our stay. The bed was very comfortable, and I have never slept so well away from home and with the windows open. This place is a hidden gem, and a tremendous value for the area. We hope it remains available for years to come, as we hope to return in 2018 on our next extended stay. Great bay view condo and location. Everything in the unit was in perfect condition (including the towels!). The kitchen was exceptionally well stocked and super clean. The entire unit sparkled when we arrived. We loved everything about the unit, the view, the location, and the peaceful silence at night. Would have stayed many months if we could have, and just might on our return trip. We had a wonderful extended stay at this amazing bay view condo. Very clean and well done. We appreciated all the extras, including ground coffee from Starbucks and Peets, the wine, and well supplied kitchen. You truly thought of everything with the extra laundry detergent, fabric softener (which wasn’t necessary – was fully appreciated! ), dryer sheets, extra paper products, second set of pillows and sheets, etc. This was the most tidy and well stocked home we’ve stayed at in years. We loved the ocean view, and distant sounds of the harbor seals (or perhaps sea lions?) in the evenings. It was such a quiet and peaceful place – perfect “home away from home” for any short or extended stay. We also appreciated the modern conveniences in the building (the elevators and parking were fantastic), and the location was unbeatable. We felt very comfortable during our stay, and would return anytime. Thank you for being such a wonderful hostess, and for your careful attention to detail. Located on the edge of the Embarcadero closer to Coit Tower and Fisherman's Wharf. Short block from Pacific Fertility Center, Golden Gate Obstetrics, UCSF Radiology. Considered one of the sunniest, warmest areas in San Francisco, and well located to Alcatraz, Pier 39, Fisherman's Wharf, Union Square Shopping, Pacific Bell Park, North Beach, and many of San Francisco's best restaurants. 1) This unit has designated parking space in a secure underground garage below building. 2) There is a washer & dryer inside the unit. Supplies provided. 3) This unit has nice views, bay breezes, and is exceptionally quiet. 5) Dog: Please call for consideration. Wag.com services this building. 7) Building is handicap accessible, but unit & furnishings have significant limitations. Please inquire further. 9) 2 elevators service this building. 10) 30 night minimum stay. Preference for extended stays of3- 6+ months.